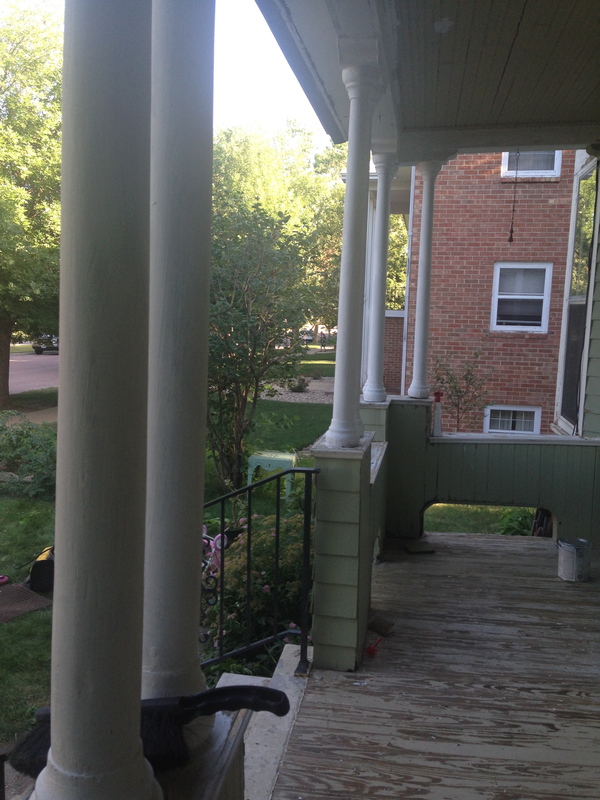 This weekend, I feel progress was actually made on the porch. Unfortunately, a discovery was made that is probably a major setback. 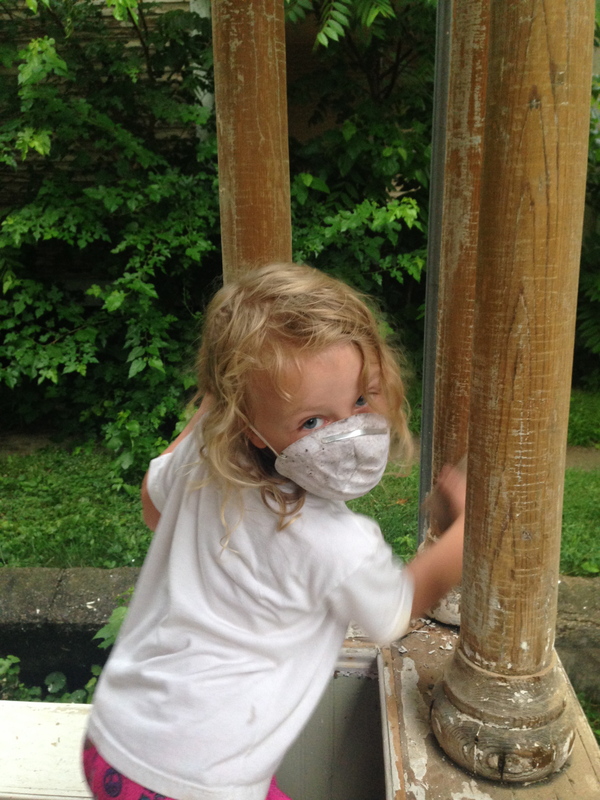 Still, claiming victory over the endless scraping of the colonnades and other trim, and opening up that first gallon of primer felt so good. We are making progress. Things are getting better. Hooray for the pressure washer! 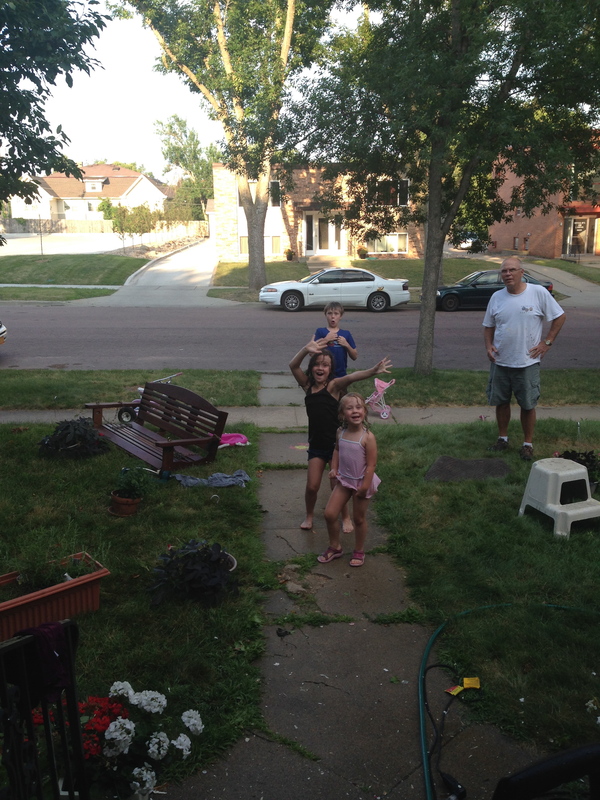 the kids enjoyed getting hosed down, and it was very satisfying to see all the years of dirt pour off the siding. 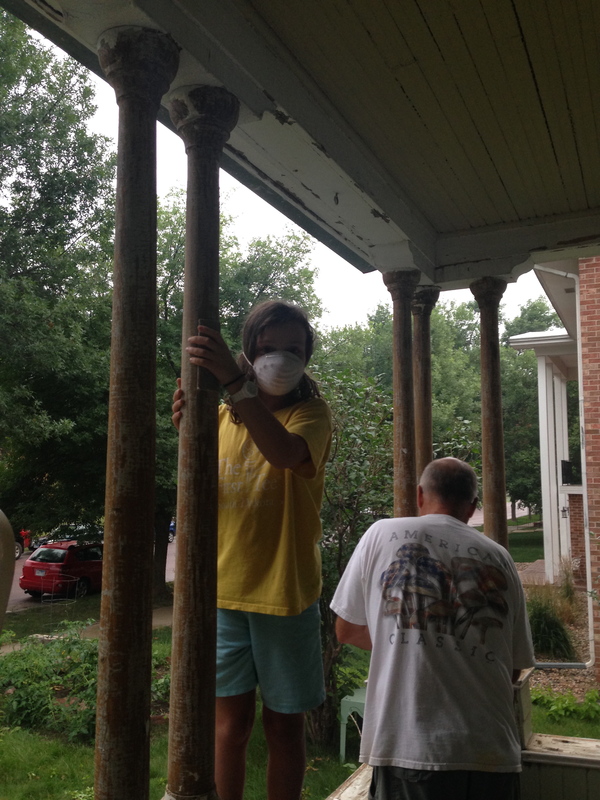 The kids worked on the house a lot this weekend with us. I love thinking of all the memories we are making by doing this together as a family. Oh those colonnades. I spent SO MANY hours stripping them with the heat gun. It was worth it though. They look beautiful- even with just with primer. While I worked, I marveled at uncovering what I thought might be the original paint color (light grey). I imagined how different EVERYTHING was about the day someone put that paint on. The city was still so new. The owner had memories of the CIVIL WAR. His sons and wife likely all worked together to plan out this beautiful home. Before, they had lived in the basement of the school where Harrison DeJong was a janitor. Now they would have colonnades. As more and more wood became exposed, I just couldn’t get over the fact that the last time anyone had seen this bare wood, it was 1889. And now here I am, making sure that in 100 more years, someone can appreciate them as much as I do, and as much as Louisa DeJong sure did, and all of the other women of the house have in between. Lots of rotten wood. It is pretty much mush under there, and I’m afraid it will go on for quite a ways into the support. This is probably why the colonnades above have separated away from the base here. The same thing is happening on the other side of the porch. So. What now? 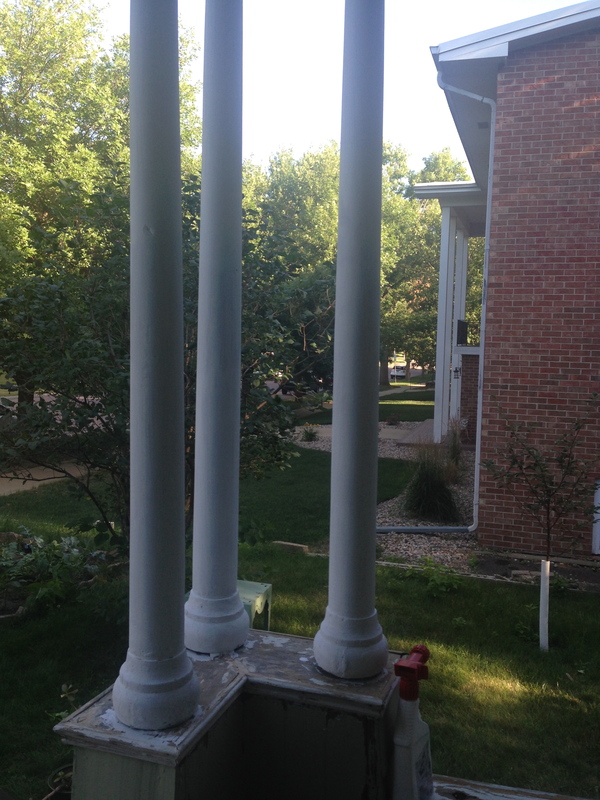 Probably, we will have to tear off the front of the porch and start over (of course replicating the original). I am HOPEFUL that we won’t have too. I have done a small bit of (Internet) research and there are some wood epoxys out there that can be used structurally. It might be a solution, at least to buy us another 5-10 years. We shall see. 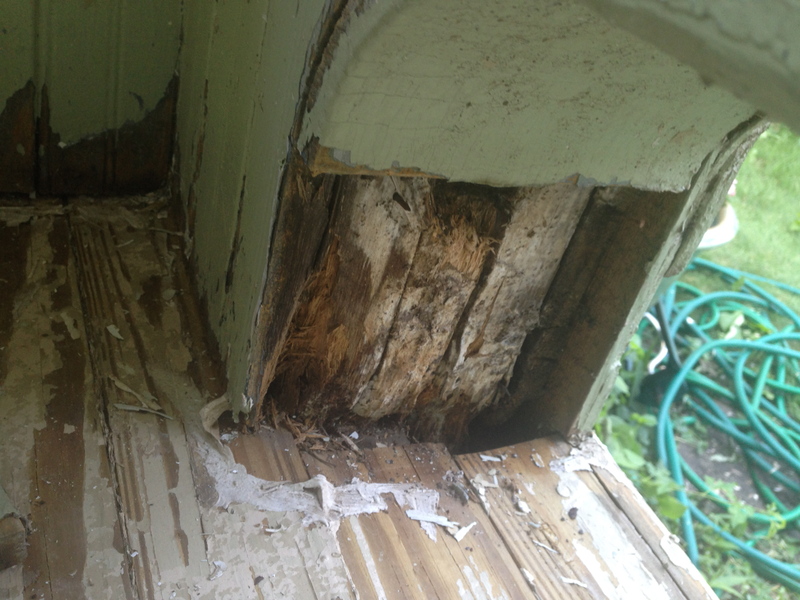 Discovering all that rotten wood was a bummer, but not too surprising. These are the things that happen to a house that has been through 125 years on this Earth. And these are the things that happen to people that choose to live in and care for such homes. We are stewards. Owning a home that was planned for, built by and lived in by people so far removed from my time in history has been a gift in itself. It has been a way to understand my place in life. Time here is so brief, and I can’t take this house or anything else with me when I move on. I have a chance to write a chapter of a story that has been in the process of being written long before my great grandparents were babies. I can do my part to take care of this Old Soul of a home. It is still standing after most of the homes around it have been torn down or moved away. It has survived because people have loved it and done the right thing by preserving something beautiful. Now it’s my turn.